November has just begun and Black Friday is rapidly approaching (24 November). Already, retailers have been "leaking" out adverts left and right. South African's don’t celebrate Thanksgiving and until recently, we didn’t celebrate Black Friday, either. I think Shoprite was the first store to start #BlackFriday in the country, then almost every retailer followed. And since many of us have watched for years American Black Friday shoppers on YouTube, we knew exactly what to do. Last year, Checkers had one of the longest queues I've ever seen for a retailer. I've only seen those kinds of lines when there is a concert of a soccer game. Takealot website went down on the first day of the 'Black Friday – Blue Dot Sale'. Game store had its first customer who waited 12 hours only to buy 12 bottles of 2l Creme Soda drinks and a cake. Social media had a field day with the #BlackFriday hashtag. The tweets moved from funny to happy to sad. 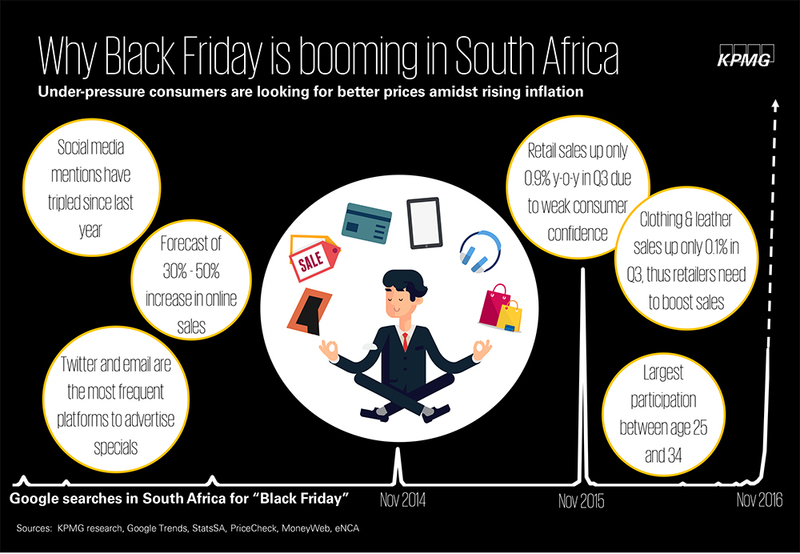 This infographic shows how South Africans’ Google searches for more information about Black Friday increased dramatically over the past few years. Clearly, there is a huge market for #BlackFriday. According to data released by Statistics South Africa (Stats SA), annual retail sales were up by 3.8% in November 2016. Black Friday helped boost sales growth by 3.5% from October 2016. The highest annual growths were recorded for retailers in hardware, paint and glass (5.4%); pharmaceuticals and medical goods and cosmetics and toiletries (4.9%); and general dealers (4.7%). Clothing sales increased by 1.9% and furniture, appliances and equipment contracted, with annual sales growth at -0.8%. General dealers were the main contributor to the 3.8% sales growth, with two percentage points. If you opt to avoid Black Friday, there’s always Cyber Monday three days later. Cyber Monday, a term coined by Shop.org, was launched to pump up the online holiday shopping season. And like Black Friday, Cyber Monday features an array of super sales. 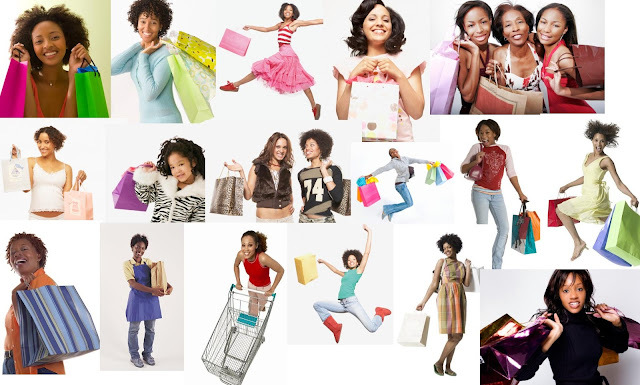 - Do your research and plan ahead to minimize the need for post-retail therapy. The best strategy for smart shoppers is to research and price compare. Start with an actual list and decide exactly how much you want to spend. This is especially helpful in quick decision-making during fly-off-the-shelves sales. - If you are buying online only, make a list of all the stores that may sell items you are interested in purchasing. Create accounts at all stores so you can check out faster. Fill up your online shopping cart in the week leading up to #BlackFriday and #CyberMonday. Then early morning that day, check to see which items you've selected that are now on sale. This will help you to keep you focused and keeps you from making purchases that you didn’t really want in the first place, just because they are discounted. - Shop early in the day. Queuing up early in the day is the best way to get your pick of discounts. Often, by the afternoon, the most exciting products have already been sold out. - Sign up for email newsletters and follow your favourite retailers on social media for early access to sales and additional discounts. One way to beat virtual crowds is to shop from the bottom up of the sale page. Everyone else will be shopping top down so things sell-out more quickly at the top of the page. - Not all products on sale for Black Friday are a great deal. Some retailers repeat the same or similar products and pricing each year, and leftover products are often sold at the same or even lower prices at Cyber Monday sales. Here is the #BlackFriday 2017 list. Spree will be taking part in the worldwide phenomenon known as Black Friday when the world goes into sales mode. Be sure to keep an eye on their site as things are sure to sell out pretty quickly. Zando claims to have the biggest and best Black Friday deals for 2017. You can sign up to their newsletter to be notified as soon as any Black Friday deals are released. iStore has an up to 20% off sale for you on iPhones, iPads, Mac and Apple watches on almost new, demo and open box units. Amazon offers deals across every category, from now through Black Friday. Customers can find deals on everything from electronics to clothing. The page will feature “Deals of the Day” with deep Black Friday-esque discounts on select items across a variety of different categories. Takealot.com will be starting their Black Friday deals with the Blue Dot Sale. Daily Deals are available daily from 7am – 23:59pm on weekdays and from 9am – 23:59pm on weekends. Deals will expire no later than one minute to midnight each day. However, Deals have a stock limit and may expire earlier if stock runs out. Takealot offers Free Delivery on all orders greater than R450. Total Sports is hosting a sale like no other. Head down to your local or store or skip the cue by shopping online. Sunglass Hut will be having a sale on the latest designer shades and frames to suit our individual style. Makro If you subscribe to their newsletter you will be informed beforehand what you can expect from this Friday-to-Sunday sale. You can save up to 45% on selected good. Checkers will be leading the choir during this year’s sale. You can expect your entire grocery cupboard to be on sale when Black Friday. Studio88 #BlackFriday #StyleOnTheMove the countdown has begun. Boardmans, your home specialist store has the hottest seasonal trends, the widest range of international brands and great value. They have sale of up to 30% on everything. Boardmans was born in 1982 as South Africa’s original homestore and was acquired in 2004 by Edcon. It has continued to evolve and boasts an impressive range of tabletop, kitchenware and home décor offering including both new and exciting brands as well as those known and trusted over many years by customers. My Perfume Shop have the best fragrances for both him and her and these deals are valid from Black Friday 24 November up until the end of Cyber Monday 27 November 2017. GoodiesHub.com Black Friday weekend Sale from Friday 24 November till Monday 27 November. Up to 50% Discount. Emperors Palace has great deals of up to 50% off hotel stays – simply book online! The hotels participating are 5-Star D'Oreale Grand, 4-Star Mondior, 3-Star Metcourt and 3-Star Metcourt Suites. Limited time only – book between 20-24 November 2017, for stays between 20 November and 20 December 2017. Travelstart, the Black Flyday flight sale! From 24 – 27 November 2017 Travelstart is slashing the cost of flights to your favourite destinations with Black Flyday travel deals to die for! Launching with a bash on Black Friday (24 November) and running throughout the weekend until the final day on Cyber Monday (27 November). Premier Hotels & Resorts has up to *50% off their selected hotels around the country in the month of December. Their discounted accommodation will have you visiting some of South Africa’s favourite December holiday destinations – without breaking the bank. Now everyone can afford to get some well-deserved rest and relaxation. Know of any other good deals? Comment below or tweet @TheDisruptorsZA and I’ll include them! Don't fall victim to unintended impulse purchases - savvy shoppers know to put a shopping list on their smartphone and stick to it.